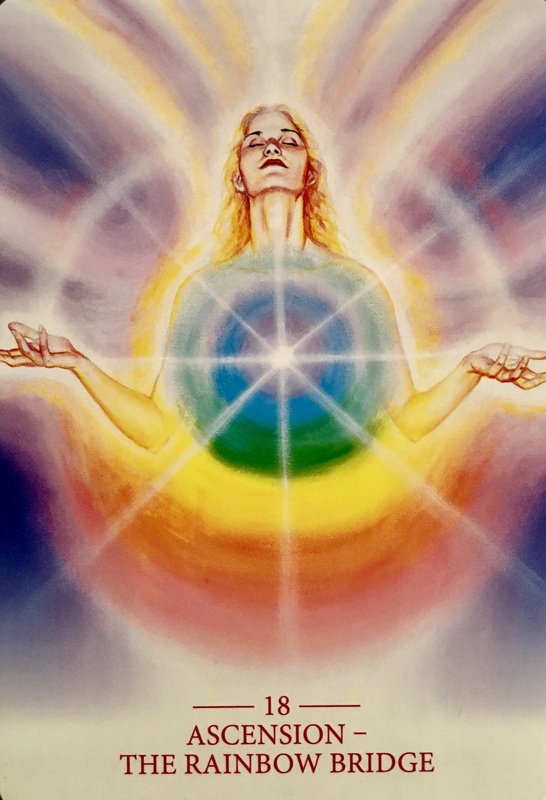 “The ‘rainbow bridge’ is a term for the channel of light that moves through your chakra system and along your spine, allowing Spirit to enter your body and stimulate the development of your soul. This bridge comes to life as your consciousness is raised. It draws in higher energies that nourish and awaken your body, mind and soul through your chakra system. As your chakras become stimulated by the increasing influx of spiritual light, a clearing process begins which supports the consequent expansion of your consciousness. This clearing is like a spiritual detoxification. It clears blocks from your mind, emotional body and physical body, as well as from your soul (such as unresolved past life issues). As these blocks are broken down and processed, emotional trauma stored in your organs and nervous system can be released, and your energy field becomes more spacious. This creates room for an increase of spiritual light. As a result, you feel clearer about who you are and why you are here and others see more clearly when they are in your field. You become more powerful. Your energy field continues to clear itself, attracting more spiritual light, becoming more visible beyond physical limits. Others can be supported by your light, even if they cannot see your physical body. You are growing as a lightworker and helping humanity in increasing ways, whilst enjoying your own spiritual growth. You are opening to a new consciousness, now. With this comes new insight, awareness and an awakening or deepening of our soul talents such as healing, clairvoyance, channelling or telepathy. Your channels are being cleared and activated. Rest. Open up and allow. Be patient and trust in your process. If emotional content arises, and you are concerned you might be falling back into old habits, do not be afraid. Find ways to express what you are feeling through writing, therapy, dance, music and art, sound and conscious movement. Explore your personal expression to allow for spiritual expansion. Today is the turning point of 2017. The solar eclipse. What will you do with this energy on offer? How can you use it to change your life path, alter your course, amplify your dreams and totally rock your world? Today you have the chance to walk the rainbow bridge. The bridge of ascension. The bridge of awakening. The bridge between the dimensions. Today, anything is possible. Anything you can conceive, for the Highest Good of All can be your new reality. With each step you come closer to Source energy. With each step you hold the future of the planet in your hands… in your heart. Each step takes you further into your power, so much more power than you ever realized was yours. You forgot about this power. Now you are called to remember. Remember why you came here. To assist in the ascension of our beautiful Mother Gaia. To assist in the ascension of all her Beings. To leave the density behind. To open your heart and lead with Love. The bridge forms beneath you only as you walk upon it with absolute faith. This future is yours to create. Center yourself into your heart and create with Love.